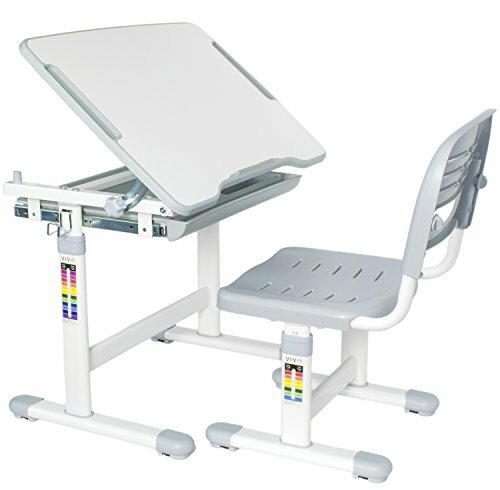 New adjustable smart desk for children (DESK-V201G) from VIVO. This interactive desk and chair station combines fun and safety for kids of varying age and size! Perfect for kids' rooms, study areas, and more, DESK-V201G features an adjustable tilting surface (from 0 to 40 degrees) made of sturdy PP grade plastic, and an organized pull out drawer for storing papers, coloring books, coloring utensils, etc. Underneath the desks surface is a 1" stopper to prevent little hands form being pinched when the desk is being tilted. The surface of the desk measures 26" x19". Both chair and desk have a sturdy steel frame and are both height adjustable to keep up with your fast growing child. The top of the desk can be adjusted from 21" to 30" and the seat of the chair adjusts from 12.5" to 17". This set is ergonomically designed for comfortable sitting and proper body positioning which is important in maintaining good health even from a young age. This desk and chair station is recommended for ages 3-10. Initial desk setup takes only a short time and once assembled is easy to move around.